Reasoned Musings: Dinosaurs And Christianity; Is There A Problem? Dinosaurs existed many many years ago. I say ‘many many years ago’ because there is an ongoing debate about the age of our earth and thereby the time or the era when dinosaurs existed. Broadly, Christians subscribe to either of the two creation models: (1) The Young Earth Creationism and (2) The Old Earth Creationism. If you believe that the age of the earth is approximately 6000 years old, then you are a young earth creationist. But if you believe that the earth was created millions of years ago, then you are an old earth creationist. The young earth creationist or those who believe that the age of the earth is approximately 6000 years would claim that the dinosaurs existed within the past thousand years. But an old earth proponent – a Christian who believes that the earth is millions of years old – would believe that the Dinosaurs existed millions of years ago. A systematic study of this subject should encompass a study of the claims and the counter-claims of the young and the old earth creationists. But because of a self-imposed word restriction for every essay that I publish for your consumption, I shall only consider the response to the dinosaur dilemma from the perspective of the young earth creationists. At this time, a famous British scientist, Dr Richard Owen, coined the name “Dinosauria,” meaning “terrible lizard,” for this is what the huge bones made him think of. …As you add up all of the dates, and accepting that Jesus Christ, the Son of God, came to Earth almost 2000 years ago, we come to the conclusion that the creation of the Earth and animals (including the dinosaurs) occurred only thousands of years ago (perhaps only 6000! ), not millions of years. Thus, if the Bible is right (and it is! ), dinosaurs must have lived within the past thousands of years. … The Bible tells us that God created all of the land animals on the sixth day of creation. As dinosaurs were land animals, they must have been made on this day, alongside Adam and Eve, who were also created on Day Six (Genesis 1:24–31). If God designed and created dinosaurs, they would have been fully functional, designed to do what they were created for, and would have been 100% dinosaur. This fits exactly with the evidence from the fossil record. If you desire to dig deeper into this subject matter from the perspective of young earth creationism, then this page5 in the ‘Apologetics Press’ website would offer you helpful resources (copy and paste the link found in the endnotes in your browser). Also please visit the website of “Answers In Genesis” to learn more about dinosaurs from the perspective of young age creationism. How do the Christians subscribing to old earth creationist model respond to the dinosaur dilemma? 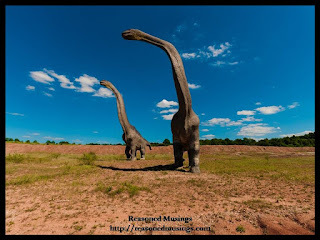 To conclude, sincere Christians endeavoring to study the subject of dinosaurs from within the perspective of Historic Christianity could either agree to the views of the young earth creationists or the old earth creationists. But as Christians subscribing to Historic Christianity, let us not condemn the proponents of the opposing viewpoint. The dinosaur dilemma and the various models/perspectives of creation (young earth creationism, old earth creationism etc.) are not essential to the truthfulness of Historic Christianity. In other words, we are not required to take a hard stand on fringe topics such as the creation model or the dinosaurs. It would be worthwhile to invest our time and energy into understanding the truth-claims that offer validity to the various essential doctrines of Historic Christianity e.g. Creation over Unguided Evolution etc. This is a better alternative than to pore over fringe doctrines because our belief in the fringe doctrines cannot jeopardize our belief in Historic Christianity. Websites last accessed on 20th July 2018.